Conditioned reflexes like sight, smell, thought of food causes secretion of the gastric juice. Presence of food in the mouth also causes secretion in the stomach. 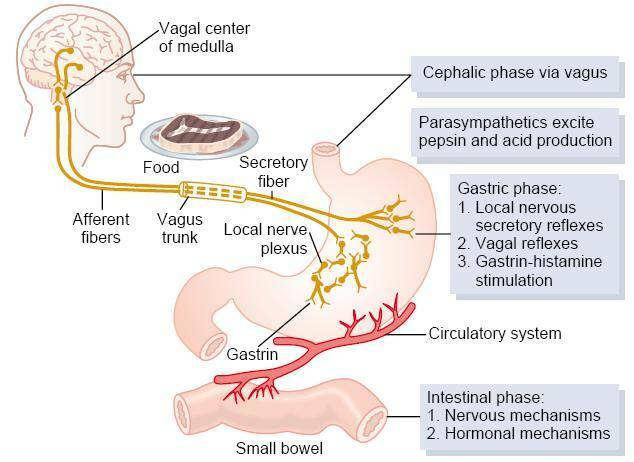 The cephalic phase occurs by the activity of the vagus. Sham feeding experiments in animals like dogs, gives a good example for the cephalic secretion of gastric juice. The quantity of juice secreted in this phase is less when compared to gastric phase. The arrival of food and distention of stomach causes the secretion of gastric juice. The secretion in this phase involves the activity of vagus and the hormone gastrin. During this phase, maximal secretion of gastric juice occurs. The arrival of food and products of food digestion in the small intestine also stimulates gastric juice secretion. The quantity of juice secreted is very less. However, the presence of products of food digestion and acid in duodenum inhibits the secretion of gastric juice. This kind of inhibition is mediated through the enterogastric reflex. The presence of acid releases secretin and fat in the duodenum releases CCK. There is also secretion of GIP, VIP hormones from small intestine. All of them cause inhibition of gastric juice. Treatment of peptic ulcer involves administering H2 blockers cimetidine, ranitidine, etc. blocking of H+- K+ ATPase by omeprazole.